From the BMC Toys AMERICAN HERO COLLECTOR SERIES, part of the greatest invasion in military history: D-DAY UTAH BEACH is a 40 piece plastic army men playset which includes 14 American GIs in olive drab, 10 German Soldiers in gray, 2 mortars, 12 Czech Hedgehogs, German Pillbox Bunker with mounted Flak 37 Gun, and a Higgins Boat LCVP Landing Craft. This set features character figures of Brigadier General Teddy Roosevelt Jr., Sergeant Harrison Summers, Field Marshal Erwin Rommel, and working ramp on the landing craft. All pieces are about 1:32nd scale and made from fairly stiff, very durable, polypropylene plastic with medium detail and very little flashing. Figures stand up to 2.45 inches tall. The bunker measures 7.62 x 2.75 x 3.1 inches tall, not including the gun which measures 5 inches long. The landing craft boat measures 12.8 x 3.9 x 3.25 inches tall. Packaged in a shoe box size retail box with and recommended for ages 5 and up. This 2017 release includes all new sticker sheets and box art. You can oder it from VictoryBuy for just under $25.00. Also from the BMC Toys AMERICAN HERO COLLECTOR SERIES, the greatest invasion in military history: The D-DAY INVASION OF NORMANDY is a much larger, 114 piece plastic army men playset that contains 59 soldier figures. The troops include 24 American GIs in olive drab, 23 German Soldiers in gray, and 12 British Tommies in tan. The figures feature Brigadier General Teddy Roosevelt Jr., Brigadier Lord Lovat, Sergeant Harrison Summers, and Field Marshal Erwin Rommel. The set also includes 2 Higgins Boat LCVP Landing Craft with working ramps, 3 German Pillbox Bunkers with mounted Flak 37 Guns, and a Bombed French Farmhouse with removable partial roof. Atlantic wall accessories include 3 Barbed Wire Fence sections, 12 Sandbag Stacks, 12 Dragon’s Teeth Tank Traps, 12 Czech Hedgehogs, and 4 mortars. Figures stand up to 2.45 inches tall. The bunker measures 7.62 x 2.75 x 3.1 inches tall, not including the gun which measures 5 inches long. The landing craft boat measures 12.8 x 3.9 x 3.25 inches tall. The farm house measures 8 x 5.75 x 7.25 inches tall and features battle damage and snap together assembly. Packaged in an a tray style storage box that features the history of D-Day and biographies of the four character figures. Recommended for ages 5 and up. Adult assembly recommended for farm house. This 2017 release features an improved farm house with reinforced walls in light tan ABS plastic, new flags and rocks, and all new package art and sticker sheets. VictoryBuy offers this huge playset for just under $75. From the BMC Toys AMERICAN HERO COLLECTOR SERIES, the fierce battle that included the most iconic moment from the Pacific War theater: The BATTLE OF IWO JIMA is a 60 piece plastic army men playset contains 24 United Stated Marines in sage green, 24 Japanese Soldiers in butternut tan, and features 6 Marines raising the American flag. The set also includes a dark green M4 Sherman Tank with a turret that rotates, gray LVT-2 Amtrac Amphibious Vehicle with 3 machine guns, 2 flags with bases, 2 small rock formations. and a large Mount Suribachi. The mountain features beach landing areas and a removable top that conceals a warren of hidden enemy bunkers. Figures stand up to 2.45 inches tall. The Sherman Tank measures 7.5 x 3.5 x 3.75 inches tall, and the Amtrak measures 9.2 x 3.9 x 3.5 inches tall. The mountain measures 19 x 15.5 x 5.5 inches high. 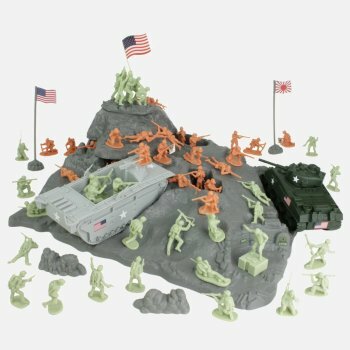 This playset was adapted from the original SANDS OF IWO JIMA fine metal and polystone miniature designs and is officially licensed by King & Country. Packaged in an a tray style storage box that features the history of the Battle of Iwo Jima. Recommended for ages 5 and up. The 2017 release features a new American flag, Japanese flag, small rock formations, and all new package art and sticker sheets. This is another huge playset that VictoryBuy offers for just under $75. Some of the older PopCult readers will remember the large Marx playsets like this from back in the day. This is a great way to recapture that fun and introduce your kids, or grandkids, to the hours of enjoyment that can be had recreating historical battles, or pitting the Army Men against Godzilla or other plastic monsters.